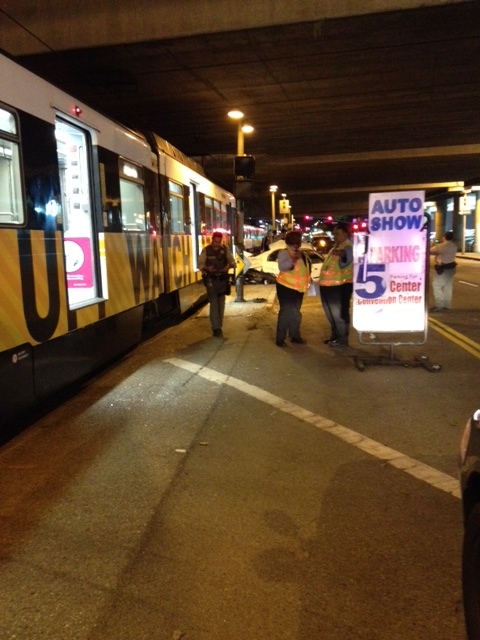 Final Update: Metro Blue and Expo Line track has been cleared of incident vehicle. At this time, trains are resuming regular evening service. As a heads up, Blue Line trains run every 30 minutes between Willowbrook and Downtown Long Beach tonight after 8:30 p.m. due to needed maintenance. For more information, visit Metro’s Service Advisories page. Metro Blue and Expo Lines are currently experiencing delays of up to 20 minutes due to contact with a vehicle at the intersection of Flower and 18th Streets. Preliminary reports suggest the incident car made an illegal left turn directly into a Culver City-bound Expo Line train. On-scene personnel have indicated this incident will take an extended period to clear. Blue Line trains are sharing one track between San Pedro and Pico Station, while Expo Line trains share one track between 23rd Street and Pico Station. Due to rail congestion, some 7th/Metro-bound trains are turning back at Washington on the Blue Line and 23rd Street on the Expo Line. Please follow station announcements. We thank you for your patience as we work to restore regular evening service as fast as possible. 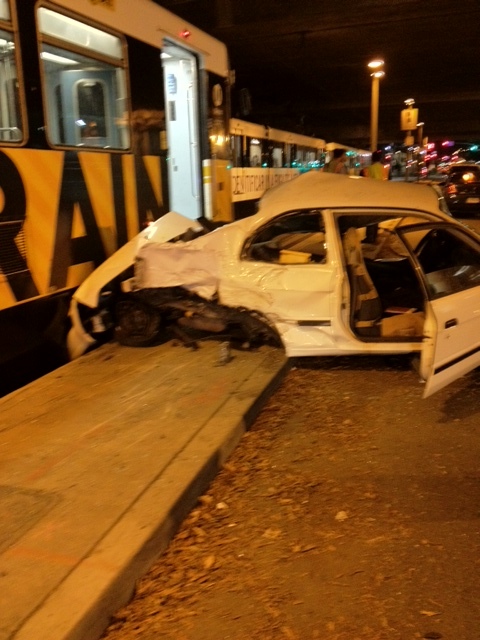 Preliminary reports suggest the incident car made an illegal left turn into the Metro train. Metro personnel on scene at Flower/18th Streets. Go Metro to Turkey Trot L.A. in DTLA on Thanksgiving! Most of the automobile is already off of the rail. Why should it take hours to clean up what little mess is on the track ? So glad we’re still building our trains at grade! Otherwise how else would you eliminate bad car drivers? What does this make now 3 or 4 train/car incidents in the last couple months? What do you expect? This is the city that still thinks it’s living in the 1950s. Agreed. This city has to wake up and see the light that LA is not the same LA as it was back in the 1950s. It’s idiotic to be planning and building rail like this. Who thought that sharing rail and cars on the same surface streets was a brilliant move? The same people who thought the honor system was a great idea I presume? Sure, blame the planners when it was the politicians who legislated that tunneling was not allowed to be considered. The sad thing is that there is no solution to this thanks to years of poor planning. The problem will continue to get worse as more cars get onto the tracks causing delays for everyone for years to come because of the brilliance of city planners to build rail at grade. They need to pass legislation that all future rail lines in the city of LA will not be at-grade from here on, just like they passed legislation that all future stations will be built with gates in mind from start. The more they get these issues resolved beforehand, the easier and cheaper it will be to avoid these problems in the future. If we didn’t build these light rail lines at grade years ago when they were first being built, we wouldn’t be in this mess in the first place. I believe it is bit too short sighted to completely ban at grade rail just for a few accidents caused by some thoughtless motorist.. They are many high capacity at grail light rail systems in North America with Calgary’s light rail system being a shining example. That aside if we were to apply the same logic to car on car collision, car on bicycle, or car on pedestrian incidents la would be cluttered with unsightly and unnecessary overpasses, tunnels. No, Flower St section shouldn’t have been grade-separated. It should have been gated. This 18th St crossing is actually not an Expo Line crossing but a formerly built Blue Line crossing. It’s probably the most accident-prone crossing along the entire Blue Line, where there is a complicated freeway-ramp entrance. There seems to be an accident there every month. So far, Expo Line has been running a clean slate with virtually zero accidents. This one still doesn’t count, as it’s on the old, shared track. There are too many of these “few accidents” happening these days. We need to start talking about banning at grade rail at least when they cross street intersections. The Expo Line Phase II construction is doing fine with all rail overpasses. Legislation can be written that when rail passes over a street intersection they must be done so that rail isn’t on surface level.